In the end, it came down to flags. It always does. In the final days of the campaign, it became all about nationhood. Arguments about sterling and the NHS and oil revenues faded into the background as both sides appealed to their supporters’ patriotism. True, there were two competing patriotisms, one British and the other exclusively Scottish. But both campaigns grasped that, in the last analysis, national feeling would trump other considerations, and voters duly went to the polls surrounded by saltires and Union flags. It was a salutary reminder in an age that tends to dismiss nationalism as ugly, atavistic and dangerous. Consider, after all, what has just happened. While some harsh words were exchanged, and a few signs defaced, there was no violence. 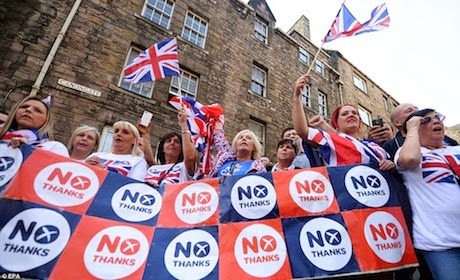 The people of Scotland voted cheerfully, and on a record turnout, to determine their national identity. A 55/45 result tells us that a measure of joint identity predominates: most Scots have a sense of patriotism large enough to encompass both Scottishness and Britishness. A new constitutional settlement, providing for an autonomous Scotland within a looser UK, will reflect that balance of identity. This aspect of the referendum is worth stressing, because our public intellectuals have fallen into the habit of judging nationalism by its most extreme and pathological manifestations. No one fired a shot in anger over the question of whether Scotland should remain in the United Kingdom. Had Scots voted the other way, all sides would have accepted the outcome and tried to make it work. There are plenty of instances of amicable divorces, from Czechs and Slovaks to Serbs and Montenegrins. As G.K. Chesterton once wrote, condemning nationalism because it can lead to war is like condemning love because it can lead to murder. Patriotism, as this blog never ceases to argue, is what makes us behave unselfishly. It is why we pay taxes to support strangers, why we accept election results when we voted for the loser, why we obey laws with which we disagree. A functioning state requires broad consensus on what constitutes the first-person plural. Take that sense away and you get Syria or Iraq or Ukraine or – well, pretty much any war-zone you can name. In his new book, How to be a Conservative, the planet-brained Roger Scruton dilates at length on how the first-person plural must be constructed. He explains why, in successful states, it is legal, territorial and secular rather than being sectarian or racial. As usual, Scruton’s case is elegant and true. But how curious that it should need to me made at all. Most ordinary people – that is, people who are not literati or politicians – take feelings of national belonging for granted, and see patriotism as an unalloyed virtue, like honesty or courage. Yet the prevailing intellectual fashion is that patriotism is artificial. The Marxist historian Eric Hobsbawn popularised the idea that nations depend on “invented traditions”. A.C. Grayling held that they were synthetic creations, “their boundaries drawn in the blood of past wars”. They can’t; and the notion that they can has led to some of the worst evils in history, from Soviet Communism to Islamic fundamentalism. Any ideology that claims to be bigger than the nation-state denies human nature. God knows we have seen often enough where that can lead. Daniel Hannan is the author of 'How we Invented Freedom' (published in the US and Canada as 'Inventing Freedom: how the English-Speaking Peoples Made the Modern World'). He speaks French and Spanish and loves Europe, but believes the EU is making its peoples poorer, less democratic and less free.